From sun up to sundown, this gulf-view, gorgeous condominium on the 4th floor of Surfside Resort in Destin has a panoramic view of the Gulf of Mexico like no other. You get the best of the views, the shimmering sands, and the vast blue-green Gulf of Mexico, straight ahead and magnificent clear view of the sunset to the west. You will feel like you are in heaven!and you sip your morning coffee on your private balcony overlooking the crystal clear waters and plan your day ahead. You can take a stroll on the beach, take a dip in the pool, work up a sweat in the fitness room. Walk to one of Destin's fine restaurants or just relax at the beach and sink your toes in the powdery white sand. This unit has all the comforts of home with 2 flat screen TVs with DVD players and all the tools you would need in a kitchen to make a gourmet meal or a snack. This unit has two bedrooms,and two bathrooms. The master bedroom has a king size bed that is as comfortable as clouds. The guest room has a queen size bed. The living room has a queen-size pull-out sofa. 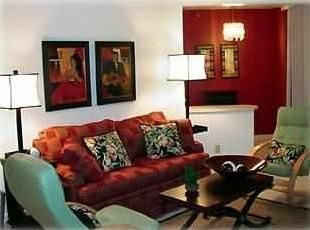 Surfside Resort is located close to amusement parks, shopping stores and many fine restaurants. This condo was in a great area, very clean with safe beach accessibility and a heated pool for a few cold days during Spring Break! Our kids loved it! We will be coming back! When you take a shower, add 20 minutes to your schedule, because you don't want to leave it. Thank you for taking the time to leave a comment and happy to hear yall enjoyed the stay! The Surfside complex is ideally located. The unit was clean and perfect for our family of 5. We booked at the last minute, but Ibrahim was very accommodating and easy to work with. The reservation, check-in, and check-out process was very simple and smooth. Great experience all the way around! Thanks! My husband and I have stayed in this condo every year for the past 10 years. We wouldn't stay any where else. The location is unbeatable and the owner is great to work with. Condo is updated yearly and always neat and clean. The exercise room is also a plus! We highly recommend this condo! We enjoyed our stay in this unit. There were 4 adults &2 children. Sofa bed could use a new mattress rest of unit was good. Give it a try. Enjoyed our get away! Owner very nice and helpful. Everything was close around. Nice quiet area. Will be returning! Sports Deck, Spa and Beauty Salon, On site restaurant, tennis, basketball, volleyball courts, shuffle board, tiki bar, hot tub, jacuzzi, sky bridge connecting pool deck onto private beach preventing from crossing the street.